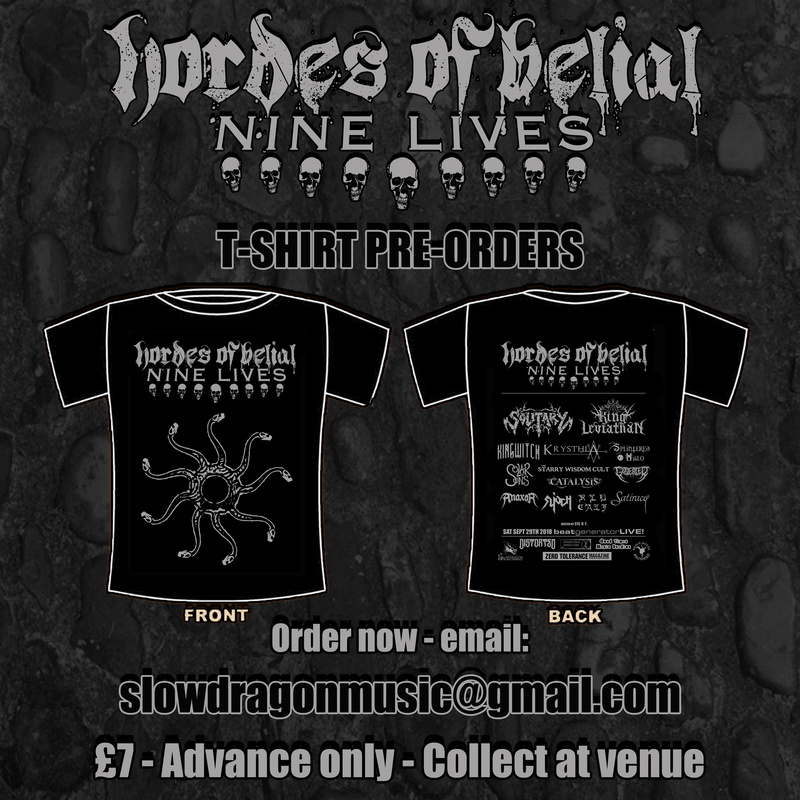 Ladies and gentlemen, the full line-up for Hordes Of Belial – Nine Lives is finally here! The last two bands have been added, and they are both absolute stormers! We’ve always made a point of not having ‘warm-up’ bands, and instead, hammering you in the face with riffs from the very first band on each stage. 2018 is no different. Cracking the seal on stage one this year, we have a band who we know a few of you will have had your beady eyes on of late: Slioch. This Inverness mob – having just launched their newest EP, A Coming Storm – have been rampaging around the Scottish underground far too much to go unnoticed. We’ve also managed to keep this next booking, the final one for this Hordes, under our hats for some time. It might not be the first time they’ve played the event, but this is a band who simply started epic, and grew epic-er by the day. One of the most powerful vocals on the Scottish scene, at the helm of one of the country’s most doom laden riff factories. Riding the wave of a debut album released via Listenable Records this spring, it can only be King Witch! 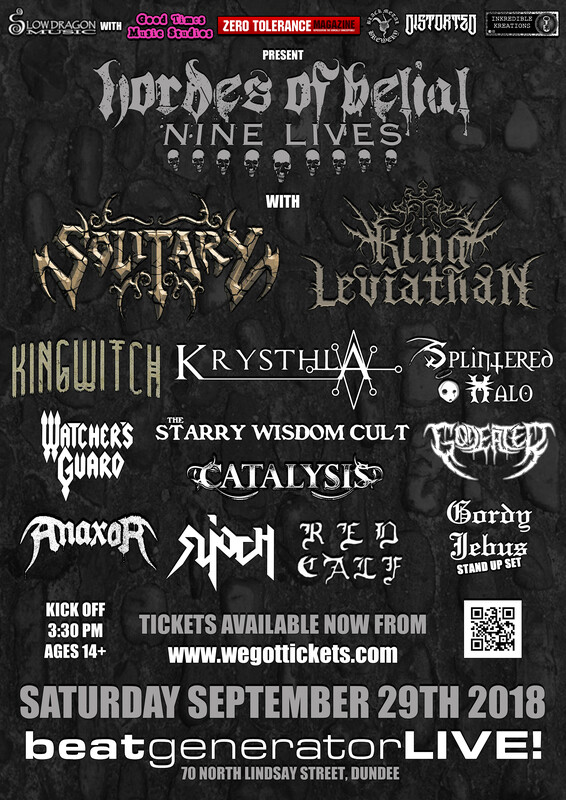 These last two bands join Solitary, King Leviathan, Krysthla, Splintered Halo, Watcher’s Guard, Godeater, The Starry Wisdom Cult, Catalysis, Anaxor, Gordy Jebus, and Red Calf, to deliver what will be a Godzilla-like stomping to Dundee! Make sure to get your tickets from wegottickets.com! 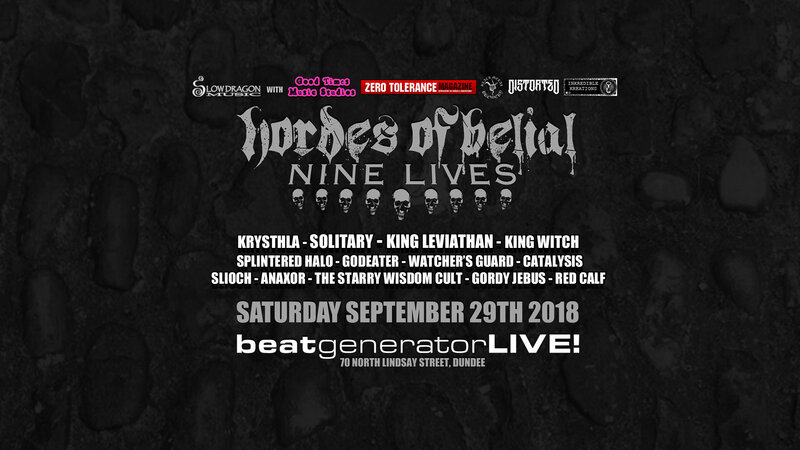 Solitary, King Leviathan, Krysthla, King Witch, Splintered Halo, The Starry Wisdom Cult, Watcher’s Guard, Gordy Jebus (stand up set), Godeater, Catalysis, Anaxor, Slioch, and Red Calf . Posted in Latest News and tagged A Coming Storm, Anaxor, Beat Generator Live, Black Metal Brewery, Catalysis, Distorted, Godeater, Good Times Music Studios, Gordy Jebus, Hordes Of Belial, Inkredible Kreations, King Leviathan, King Witch, Krysthla, Listenable Records, Nine Lives, Red Calf, Slioch, Slow Dragon Music, Solitary, Splintered Halo, The Starry Wisdom Cult, Under The Mountain, Watchers Guard, Zero Tolerance.